The technique of stuffing the chicken under the skin adds extra deliciousness. 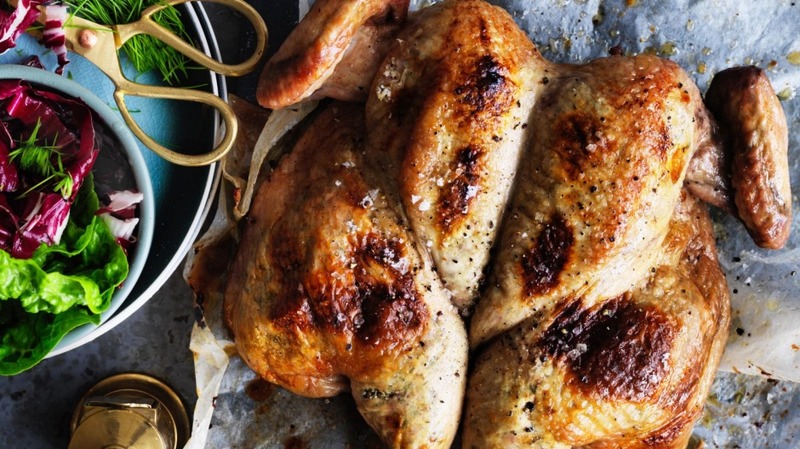 This dish is perfect with roast potatoes and a green salad. And if you buy a quality free-range or organic chook, I promise you will taste the difference. 1. To make the stuffing, put the garlic and a large pinch of sea salt in a mortar and pound with the pestle until a paste forms. Add the onion and crush slightly, then the butter and spices. Mix through, then add the herbs and ricotta. Finally, add the lemon juice and a large pinch of both sea salt and freshly ground black pepper. 2. Take the chicken out of the refrigerator two hours before cooking and bring to room temperature. Cut down each side of the backbone and push down gently but firmly on the breastplate until you have the chicken butterflied in front of you. Remove the wishbone, then slide a hand between the skin and flesh to gently loosen the skin. 3. Take some stuffing in your hand and put it under the skin of each leg, a little at a time, until the pocket is full and even. Repeat the process with the skin on top of the chicken breasts. Smooth the skin out and you should have a very handsome bird sitting in front of you, all puffed up and shiny. 4. Preheat your oven to 160C. Rub the skin with extra virgin olive oil and season all over with sea salt. Put the chicken in a roasting tin and cook for 45 minutes, then turn the heat up to 180C for 15 minutes to get some colour on the skin. Remove the tin from the oven, drain off the juices and put them to one side. Cover the chicken with foil and rest for 30 minutes. 5. Place the chicken on a chopping board, cut down the middle, then remove the legs. Cut each leg into thighs and drumsticks, and each breast into two. Put the chicken pieces on plates and spoon the reserved juices from the roasting tray over the top. Add a generous grind of black pepper and serve. If you love this recipe, check out Neil Perry's cream of fennel and parmesan soup.